FILE - Zimbabwe’s President Emmerson Mnangagwa (R) is seen at a ZANU-PF congress where he was said to still be consulting on senior party appointments, in Harare, Dec. 15, 2017. President Emmerson Mnangagwa of Zimbabwe says the country will hold elections in four to five months, the first since the ouster of longtime ruler Robert Mugabe. Mnangagwa made the pledge Wednesday during an official trip to neighboring Mozambique, according to a report in the state-owned Herald newspaper. "We have to preach peace, peace and peace," the Zimbabwean leader said in announcing the elections. He pledged to ensure free and fair elections to ensure Zimbabwe "engages the world as a qualified democratic state." Elections had been expected to be held in either July or August. 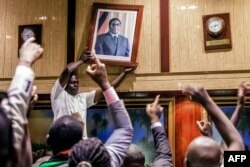 People remove from the wall at the International Conference center, where parliament had their sitting, the portrait of former Zimbabwean President Robert Mugabe after his resignation, Nov. 21, 2017, in Harare. The 93-year-old Mugabe ruled Zimbabwe for 37 years before he was forced to resign under pressure last November after he was removed from power in a shock move by the military and lost support of lawmakers in his ruling ZANU-PF party. During Mugabe's long rule, elections in Zimbabwe were marred by vote rigging and violence.